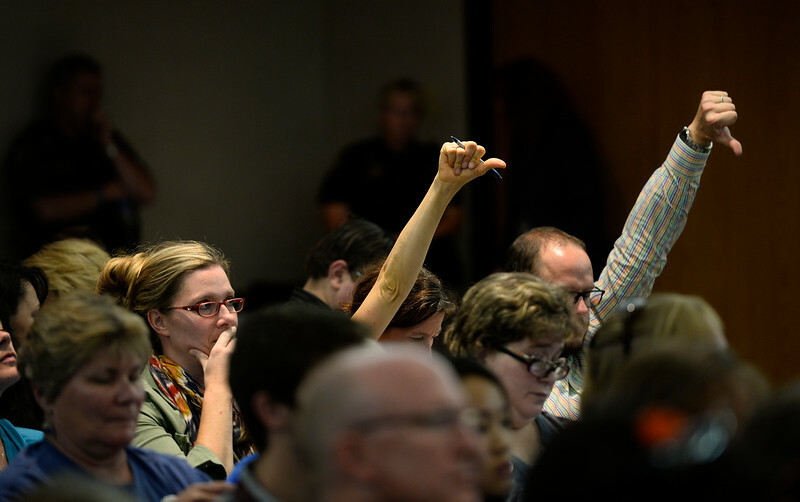 Audience members react to the school board’s hasty vote on expanding the review committee. At the Jefferson County, Colorado school board meeting Thursday night, a contentious plan to review the Advanced Placement U.S. History curriculum was modified but not entirely defeated. Although the board did not vote on a proposal to avoid materials that “encourage civil disorder, social strife or disregard of the law,” many teachers, students, and parents fear that the board’s actions at the meeting will lead down the same path. After a nationwide outcry and local protests from teachers and students over board member Julie Williams’ proposal to require that the AP History curriculum promote “patriotism, respect for authority and free enterprise,” the board opted not to vote on that language for the time being, although Williams refused to withdraw it. Three members did, however, vote to expand an existing district-wide curriculum review committee to include students, administrators, and community members. Because the board will likely have a hand in appointing the new committee members, supporters of academic freedom say that the three-person majority may simply select individuals who share their ideology without needing to spell out which elements of the curriculum are verboten. In fact, this aligns with what board president Ken Witt hinted at more than a week before the meeting, when he said that “a lot of those words [in Williams’ proposal] were more specific and more pointed than they have to be.” Meanwhile the College Board, which administers AP tests and develops the curriculum framework, informed the school district that the course could lose its AP designation if it were substantially censored. Some students and parents at the Thursday meeting invoked the possibility that the newly expanded curriculum review committee might also decide to take on literature or science courses, although nothing will be certain until the additional members are appointed. We are keeping a close eye on developments in Jefferson County and will keep you updated!